Saturday's hike had been listed as a "Hike with Dogs", meaning you either liked dogs or had one of you own, hopefully both. I love dogs and don't have one of my own, so I just love up other peoples' dogs instead. While at one point I had as many as 8 people and 4 dogs signed up, the hike was a total of 6 people, no dogs. A group of six is a nice, manageable size, especially for a long haul like this one. The out-and-back distance to Airplane Meadows was in the neighborhood of 14 miles, though without much elevation gain. At the foggy trailhead northwest of the town of Greenwater, David predicted we would have sun by 11AM and a few miles into the hike, I spotted a blue hole directly above the group. Unfortunately, the hole didn't follow us and we had a mixture of fog and sun. We were making good time when we found the side trail to visit Arch Rock. Since I had never been there before, I wasn't quite sure what to expect. Was there an arch? Would it be obvious? After we followed a meandering trail uphill, with patches of snow to confuse us and sticks that seemed to be placed deliberately across the trail, we arrived at a ledge and what I saw beyond made me gasp. In the fog, it looked like we had stumbled across ruins – a huge slab of rock towered beyond the cliff and seemed to have a winged creature (very gargoyle-esque) toward the front. We made our way along the cliff's edge to get a better view of the rock. On the way, the clouds parted enough to see Mt Rainier in the other direction. Up to that point, we had been making good time, traveling at a steady moderate pace on the PCT as it gained elevation gradually, but the rock and the view threw us off our pace and would contribute to a very late return time to our cars. We still wanted to see Airplane Meadows so we lunched just off the trail and headed south once more. 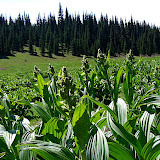 At about the 7 mile mark, we came to a meadow with Hellebore and its wavy leaves, plus green grass, green trees as far as we could see. And then there was the airplane, or what was left of it and a little view of Rainier over the trees. Oh, and the bugs – they kept us from stopping for too long. Back on the trail, we cruised downhill, seeing areas in sun that we had only seen before in the fog. And we learned that our fellow hiker, Leigh, had only moved to the area 7 days prior but had obviously already made good choices about with whom to hike and where to go. We came across a group of people, their dog, horses and mules and learned that they were the Backcountry Horsemen and take it upon themselves to maintain sections of the PCT. They do great work, but there's a price to pay: the trail was turned into a mud bog as it left the PCT and returned to Government Meadows at the end of FR 70. Soon the mud bogs gave way to trees dripping with lichen and moss-covered bark and we knew we were close to our cars. We estimate the hike was closer to 15 miles, due to the side-trail. After the hike, I sent my dog treats home withe Joel for his pup, Capone, whom he didn't think could have made the trek. Trip participants were David W, Joel M, Leigh C, John P, Tom Y and me. Woof!